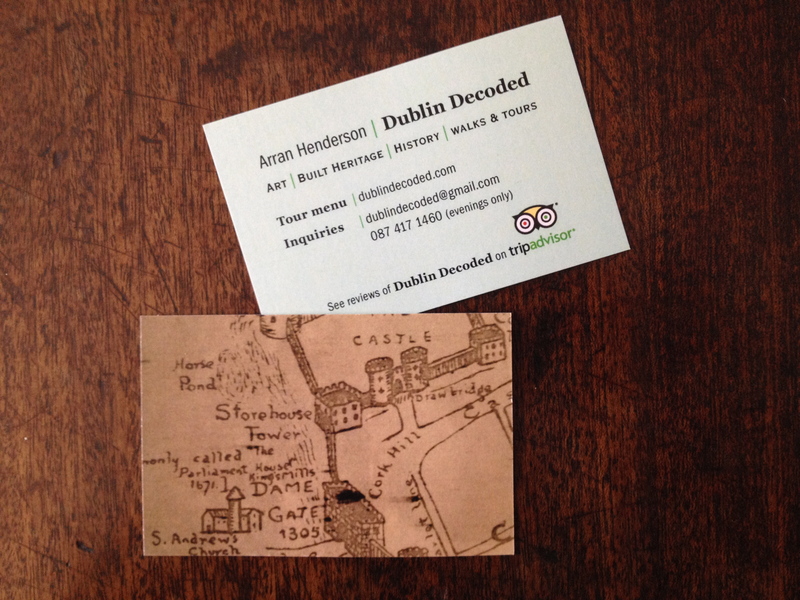 Suddenly Dublin Decoded looks and feels, all grown up. For the front I used a detail from my favourite map of medieval Dublin. It’s a beautiful little map of the former walled city, showing the line of medieval walls, with all its gates and towers. 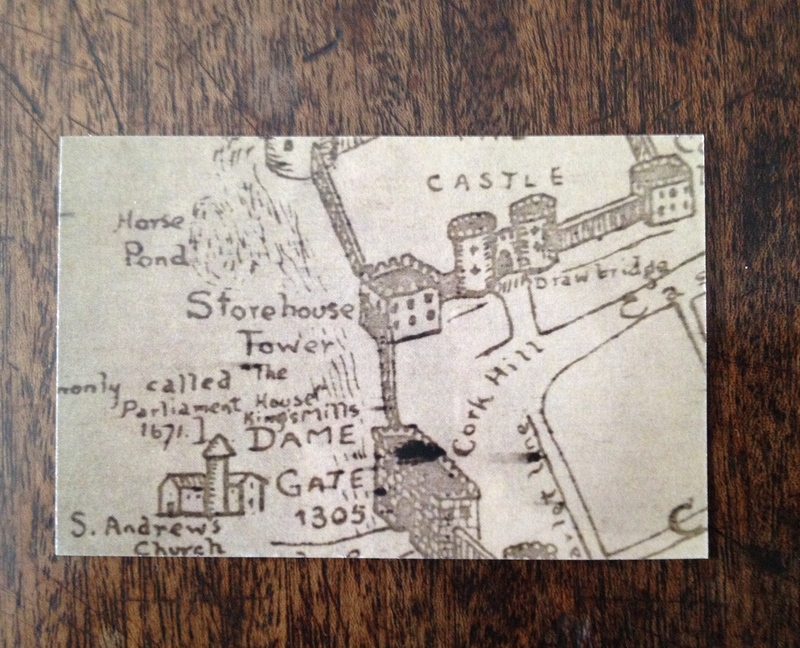 This particular tiny detail shows part of Dublin Castle, along with Cork Hill and Dame Gate. I use copies of this this map and pass it around on the Medieval to Georgian tour of Dublin City Centre, as it’s a simple, visual way to relate the huge changes, from the old shape and fabric of the medieval city core, to the modern street-scape. It would be remiss not to say here, we’re run our Medieval walls, Gates and Walls tour, and the Medieval to Georgian walks a couple of times each month month, Sunday 25th May, so to find out more or sign up, see here. 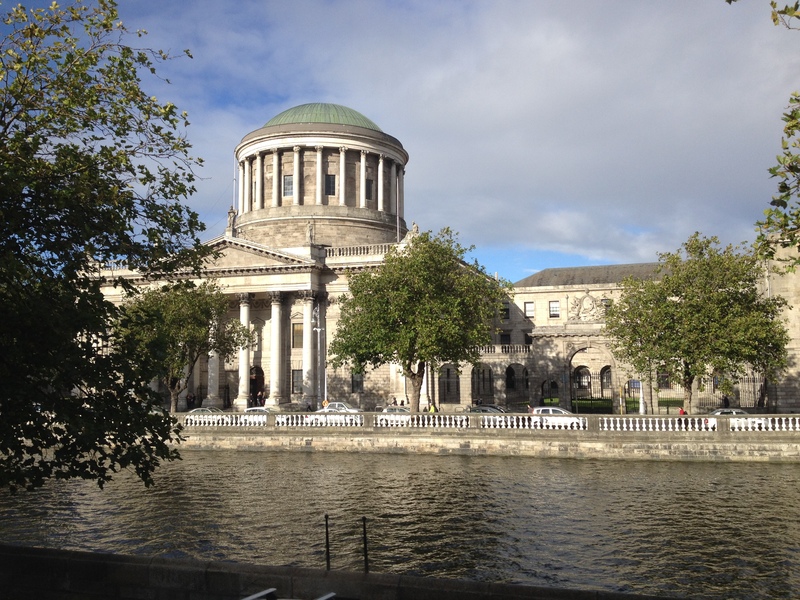 The only image on this side is the logo of the TripAdvisor website, where reviews of Dublin Decoded tours tend to universally positive. 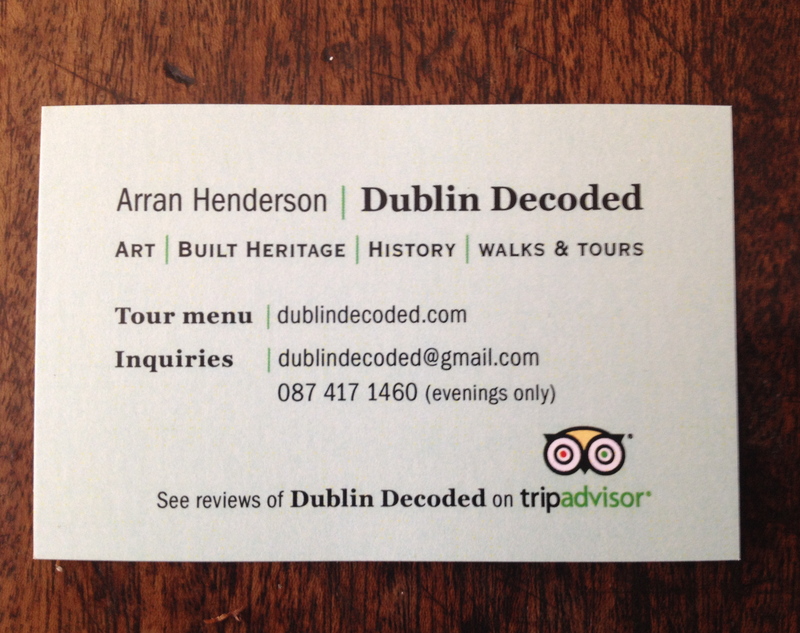 So there you go, Dublin Decoded finally has its own card, reminding people about the reviews and our own website with its tour menu. With luck, people will take the time to look at the website, then use the email contact provided there, once they have an idea of what we do and what we offer. As mentioned above. the Medieval Mass to Georgian Splendour walking tour takes place once a month, usually early Saturday or Sunday afternoons. Thanks for reading. We look forward to seeing you on tour sometime. Thanks very much. I’m delighted. 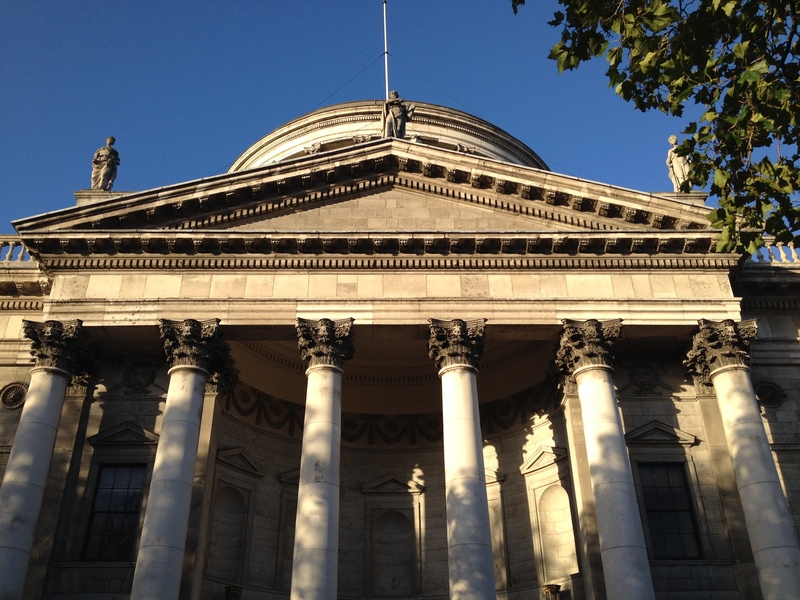 Next time I am in Dublin to visit my sis, bro-in-law, niece and nephew, I’d like to come on one of your tours. The card looks fantastic by the way. It would be great to see you and have you on a tour. I’d be delighted. Also delighted too you like the cards, I’m pretty chuffed with them. Just can’t believe it took me so long. Obviously not one of life’s natural business people ! I hope they will make a big difference to your turn over. I hope people don’t just nick them for souvenirs, I would! We’ll see if they make a difference, hope it will in the medium to long term, but I think it was high time I got some. It was getting a bit embarrassing, when occasionally people asked: Do you have a card? – and I had to say ermm… No ! Feel better about that now. Plus, I’m quite proud of them. If you think they are a nick-able souvenir, that definitely a good sign. The icing on the cake! The image of the map on the reverse is a nice touch… good job! Hey, hi, thanks. Music to my ears! Previous Post Lies, Myths (and television) about the First World War.